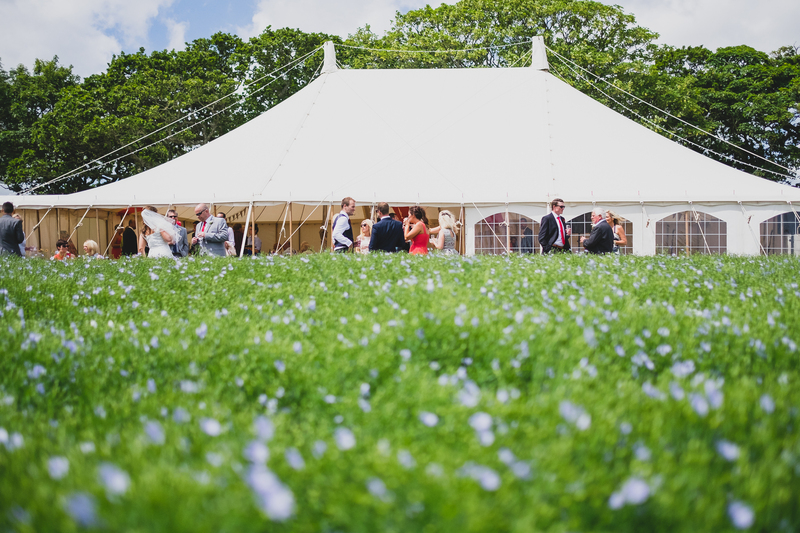 Our Wedding & Event Field is the perfect venue for marquee wedding receptions, festivals and outdoor events. Our site is offered exclusively to you as a blank canvas with few restrictions. We have a large parking field and plenty of space for camping & glamping and our onsite caterers can even cook a full English breakfast for campers the next morning from our catering kitchen. Please see below for our FAQ and Terms & Conditions. To enquire about the hire, availability and pricing of our venue, please call 01736 732711 or email us. Huge 7ft fire pit hire £150 (includes all the wood) for the evening of your event. You will need to source your own marquee/tipi/stretch tent, generator & toilets. If your guests are camping you may wish to consider hiring showers, bells tents and extra toilets. Please see our recommended supplier list, the Cornish wedding industry has some truly talented people who can make your wedding or event come to life. We do hold public liability insurance but we also strongly recommend you take out your own wedding insurance from a specialist wedding insurer. Do suppliers need to provide public liability insurance certificates? All external suppliers must provide copies of their public liability insurance certificates. Do you hold a licence for entertainment and alcohol? We do not hold a permanent premises license for the sale of alcohol and live music. Working in conjunction with you and your suppliers we apply for a temporary event notice prior to your wedding or event. We ask that all amplified music ends at midnight Mon-Fri, 1am on Saturdays and 11pm on Sundays. However we can apply for later licences with prior notice. Can we have a bonfire? We are happy to set up and maintain a fire pit for you in the Wedding & Event Field for the evening of your event at a cost of £150. This includes all of the wood required and means you don’t have to worry about it. Fire pits, camp fires and BBQs must be set up by management, guests are not permitted to set up fires independently. This is to ensure our health and safety and fire regulations are followed at all times. Are you able to provide crockery, cutlery and glassware? We do not have any of our own crockery, cutlery and glassware for you to hire. However, we are happy to give you the details of a local hire company or organise this hire for you. What could be better than waking up deep in the Cornish countryside? We don’t think anything beats this feeling and therefore offer the opportunity for you and your guests to stay on site. 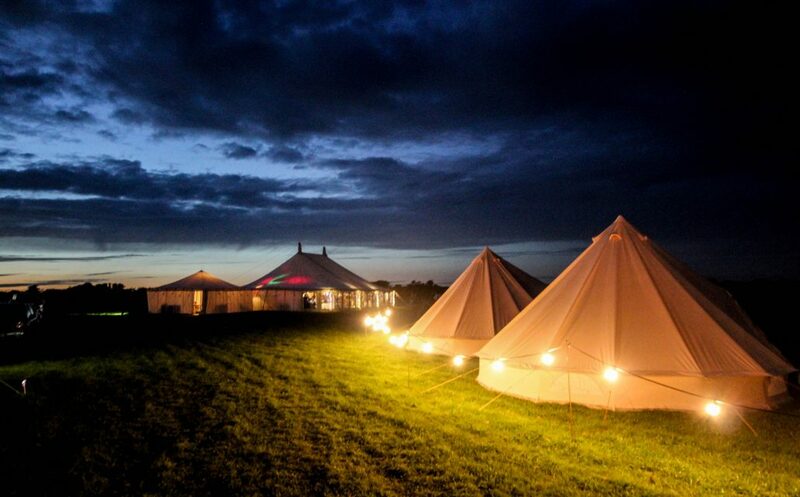 From traditional camping to glamping you can have it all! Guests can stay on site in their own tents/camper vans; or why not book some beautiful bell tents, tipis or yurts from one of our local suppliers. There are also many lovely bed and breakfasts, hotels and self-catering cottages available locally. Just ask, we can point you in the right direction! 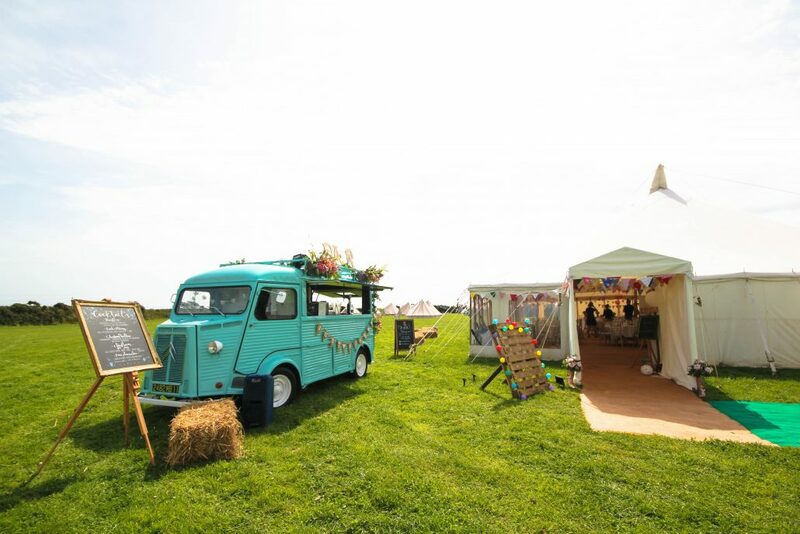 The brilliant White Radish Events are based at the venue and have their very own catering kitchen right on the farm, giving them the flexibility to offer you a complete catering package. Using high quality local ingredients and as much of their own produce from the farm, they can put together imaginative and creative dishes to suit all tastes and budgets. White Radish now offers some amazing festival style catering packages. We do not hold a license for civil ceremonies, therefore the ‘official bits’ will need to be carried out elsewhere. There are a number of local Registry Offices in the area. The nearest churches are Lamorna, Paul, Newlyn, Penzance. To organise the ‘official bits’ you would need to contact the registrar / vicar separately, but we are happy to assist with this. Are we able to have a blessing on site? Of course! A blessing ceremony can be as personal as you want it to be. We know some wonderful local celebrants who would be delighted to assist or why not ask a family member or friend to do the honours! With the Atlantic ocean as a backdrop, this is a truly romantic setting in which to exchange your vows. Maximum 200 people, although we try to be as flexible as we can and are happy to discuss higher numbers. Yes, we have several local suppliers that we can recommend or book on your behalf. Please contact us with your requirements for more details. Do you allow children and pets at the farm? Yes, we do allow children at Tremorna Farm, but we do ask that they are supervised at all times. We only allow pets by prior arrangement due to the livestock on the rest of the farm. Unfortunately we do not allow Chinese lanterns due to the livestock and hay barns on the farm. Fireworks may be permitted at certain times of the year with prior notice. Please do get in touch to discuss. Can you provide small bales of hay or straw? Yes, we can provide bales of hay! Hay bales can be hired at a cost of £3.50 per bale and are all produced on the farm. They make brilliant seating, each one accommodating 2-3 guests. Do you have parking available and can cars be left overnight? There is ample space for all of your guests to park and not to impact on the rest of your celebrations. The Camping & Parking Field adjoins the Wedding & Event Field and is accessed through a break in the hedge. It’s a short walk to the marquee! Car parking signs and help with parking is available upon request. We do allow cars to be left overnight but we do ask that all vehicles are removed by 3pm the day after your celebration. We allow all natural, biodegradable confetti, such as real flower petals. Can my photographer/supplier come to have a look round before the wedding? Yes, we just ask that they make an appointment beforehand so that we can be on-site to show them round and answer any questions. Hire is for the designated areas only. As we are a working farm, for your own safety please do not attempt to access any other parts of the farm. Hire is from Fri 9am-Sun 3pm for weekends and Mon 9am-Weds 3pm for mid-week. Amplified music must end at midnight Mon-Fri, 1am on Saturdays and 11pm on Sundays unless we have agreed otherwise. A member of the bridal/event party MUST be on site to meet & greet guests as they arrive and direct them accordingly. We can provide extra members of staff to do this for you (extra costs will apply), please request at time of booking. We do not allow pets at the venue due to the livestock. We request that you set up a designated smoking area for your guests including bins for the appropriate disposal of cigarettes & cigars. The fields must be left as they were found with all rubbish disposed of correctly. You can choose to dispose of any rubbish yourself or use one of our disposal options (charges will apply). The fields will be checked before security deposits are refunded.